This charming neighbourhood eaterie is a family run restaurant that exudes good cooking and lively, light-hearted atmosphere, and familiar faces of the friendly staff. The restaurant has an Italian menu that will tempt even non-pizza-pasta lovers. Done forget to ask for the special of the day. The décor is homely with plant baskets hanging over peach walls and paintings. Each table is adorned with fresh posies and numerous rows of wine lie on display. In the summer there's a canopied terrace perfect for al fresco dining. The main restaurant can accommodate about 30 guests with a further 15 dinning on the canopied terrace during the summer. There is a private room downstairs that can accommodate 30 guests and is perfect for the more private celebrations. There�s a hi-fi and a screen, which can be used to enhance your special occasion. Service is warm and friendly. Children are welcome. Set menus or buffets are available for the parties. Pre/Post theatre set menu �14.95 per person. The authentic cuisine is likely to remind of your favourite meals in Italy. Expect some well-made Italian classics, highly recommended pasta dishes and there are some excellent fish specials. 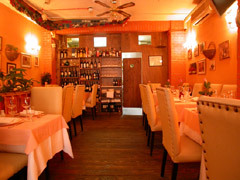 There�s a good all- Italian wine list and a free shot of homemade liqueur at the end of your meal. That's amore!